Errors in reproducing CC distances for some hydrocarbons. Taken from J.D. Da Motta. Valence manifold of the ground state of AsBr from Pontes et al. Joaquim Delphino Da Motta Neto was born in 1961 at the sunny, coastal town of Vitoria, ES, in southern Brazil. He was raised in a poor neighborhood of Rio de Janeiro, to where his family moved when he was just two years old. His mother taught him to read and write when he was just three, and the kid started to read everything that fell in his hands, from comic books to encyclopedias. He was specially fond of Verne`s Around the World in Eighty Days and Tahan's The Man Who Calculated. Later on, his parents ensured he attended one of the best high schools in the country, the so-called Imperial College (named after the late emperor Pedro II). Joaquim began a research in Physical Organic Chemistry in 1985, as an undergraduate under the guidance of Prof. Ricardo Bicca de Alencastro. He graduated at the University of Rio de Janeiro (UFRJ) with majors in Chemistry (January 1987) and Chemical Engineering (August 1988). Then he began to work in the testing and debugging of the newly-designed Generalized Multistructural (GMS) method. He completed his M.Sc. degree in Physical Chemistry under Prof. Marco A. Chaer Nascimento working on the GVB and GMS description of the acidity of organic compounds. In April 1991, Joaquim moved to Gainesville and joined the group of Prof. Michael C. Zerner in the Quantum Theory Project at the University of Florida, where he started working in the development of the ZINDO code. His job was to test a set of semiempirical parameters which would be simultaneously good for geometries and spectroscopy. During his stay at Gainesville, he also worked in Biology problems such as antimalarials and drugs for AIDS. He obtained his Ph.D. degree in May, 1997. 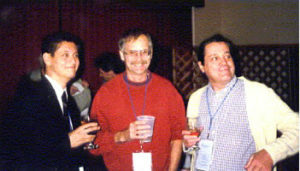 Joaquim with Prof. John Head (Hawaii) and Prof. Ricardo Bicca de Alencastro (UFRJ) during a social break at the 1999 Sanibel Symposia. In January 1998 he assumed an Associate Research Professor position at the Department of Chemistry at University of Paraná (UFPR). Since then he has taught classes at undergraduate level for Chemistry, Chemical Engineering, Geology and Biotechnology courses, plus Quantum Chemistry graduate courses. In 2009 Joaquim has initiated a joint collaboration with the ETER Lab of CTA-ITA.This work has focused in CASSCF and MRSDCI calculations on diatomic molecules, most of them containing transition metals. Those systems are of interest in Astrophysics as well as modeling of chemical bonding. Joaquim likes to think he is not done yet.